Collectors of action figures, rejoice – for the more politically-inclined out there, an 8-inch, 3D-printable version of the famed 4-foot tall, illegal Edward Snowden bust has now been made available online, to spread the word about surveillance. 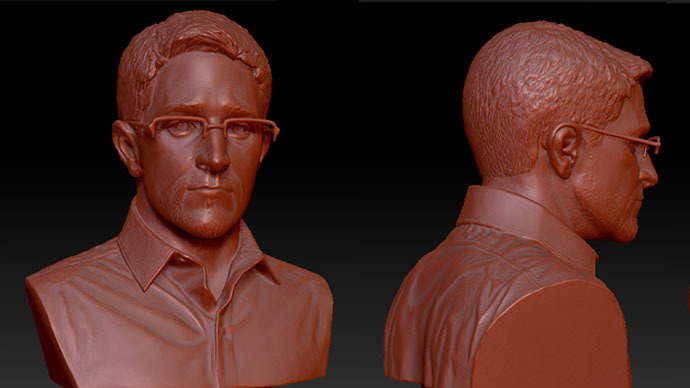 The creators of Snowden’s likeness have uploaded the 3D-printable file online on to Thingiverse – the world’s leading source for such work. This happened shortly after the NYPD finally agreed to release the original bust back to the artists – they erected the 4-foot likeness of the NSA whistleblower illegally last month, leading to its removal from its resting place at Brooklyn park. “We thought, ‘Let’s put the data out there, and find a way for it to proliferate to anyone who wants it,'” Andrew Tider, one of the creators, told Wired. Now, anyone can download, print and make their own Snowden head – even go crazy with the colors, as the sky’s the limit with 3D printing. Tider had opted to remain anonymous initially, but was then outed by the police, along with fellow artist Jeff Greenspan, when called to pick up the statue from police custody last week. They each had to pay a $50 fine for entering the park after hours and erecting the bust, which has now achieved worldwide renown and will be featured at a Brooklyn art show. “We’ve heard from people that they want one for their lawn or to put in their home … so we’re letting the world do whatever it wants to do with this,” Tider added. The artists said they’re not out to encourage illicit behavior, but Greenspan admitted he’d be excited to see replicas or variations on the theme appear in places around the United States, or worldwide. But the mission is more serious than that: the pair figure if they can get people talking about surveillance, that’s their work done. Even more importantly, the very idea that it is Snowden up there – and not, say, Beethoven – is tied to the notion that anyone can be made into a statue and canonized; it just depends on how willing you are to go with an official line on things. And the idea has supporters: just hours after police had toppled the original Snowden likeness, a visual art collective projected a hologram of the bust along with Snowden’s name on the Prison Ship Martyrs Monument in protest. Tider and Greenspan initially created a high-resolution model of the original bust for future reference. Then sculptor Doyle Tankina set about making a clay version, scanned with a handheld scanner before being made into a cast. The whole thing was then cast in fiberglass and concrete, before being covered in bronze and set on a pedestal at Fort Greene Park. It looks like the pair’s enthusiasm is paying off – the model for 3D-printing is receiving wide acclaim, and many artists are coming up with their own versions; one was recently erected in Berlin, together with statues of WikiLeaks founder Julian Assange and whistleblower Chelsea Manning, while a 9-foot version has been making the rounds in New York. On Thursday, volunteers moved the original statue to The Boiler, an art gallery, where it will be exhibited as a “special guest project” in an annual collaborative exhibition called SEVEN. This year’s theme is: “Anonymity, no longer an option.” The show will begin on Friday. It features seven galleries from New York and London, with each presenting work by one artist.